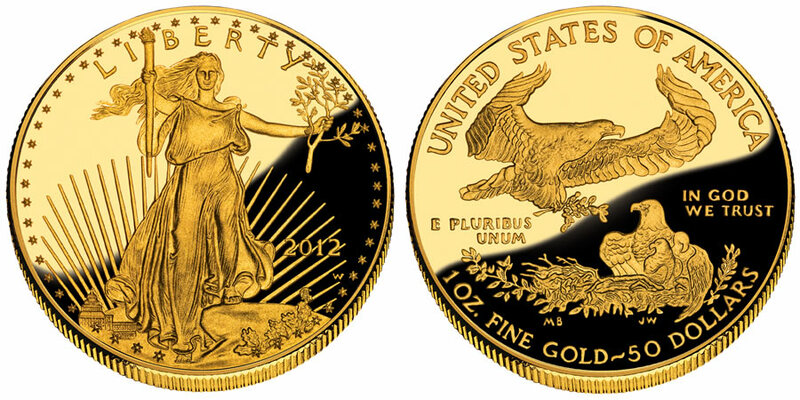 The 2012 American Eagle Gold Proof Coin marks a continuation of a series of coins from the US Mint dating back to 1986. The Gold Eagle Proof Coins are struck as numismatic versions of the Mint's bullion Gold Eagle Program and are typically available in four different sizes - a one ounce Eagle, a 1/2 ounce Eagle, a 1/4 ounce Eagle and a 1/10 ounce Eagle. Both the proof and the related bullion Gold Eagles debuted in 1986 and have been available annually ever since, with one exception. Unprecedented demand for the bullion Eagles led the US Mint to cancel production of the proof coins in 2009. The Proof Gold Eagles made a return in 2010. According to the Mint, Proof Gold Eagles are created through a process which involves "manually feeding burnished coin blanks into presses fitted with special dies. The coin is struck multiple times so the softly frosted, yet detailed images seem to float above a mirror-like field." The obverse of the Gold Eagles contain a design considered by many to be one of the most beautiful ever struck on an American Coin. It features Liberty as designed by Augustus Saint-Gaudens. This image of the mythical figure was first used on the 1907 $20 Double Eagle Gold Piece. Obverse inscriptions will include the word "LIBERTY" and the year. Shown on the reverse of the coin is the image of a family of eagles as designed by Mrs. Miley Frances Busiek. Also included are the words "UNITED STATES OF AMERICA", "E PLURIBUS UNUM", and "IN GOD WE TRUST". The amount of gold content and its corresponding face value are shown as well.